Two or more players side-scrolling coop action? I was already in for the single player but you can be sure there'll be a few of us playing this from my couch come October! WARSAW, Poland – July 24 , 2018 – Warlocks 2: God Slayers, the 2D co-operative ARPG combining a retro aesthetic with fresh hack 'n' slash mechanics, will come to Nintendo Switch and Steam when Fat Dog Games and Frozen District release their collaboration in October 2018. PlayStation 4 and Xbox One versions will follow in Q1 2019. "Warlocks 2 presents an exhilarating spread of multidimensional travel, side-scrolling adventure and hack 'n' slash combat," said Krzysztof Krej, chairman of the board, Frozen District. "It's the perfect blend of humor and action to share with friends." 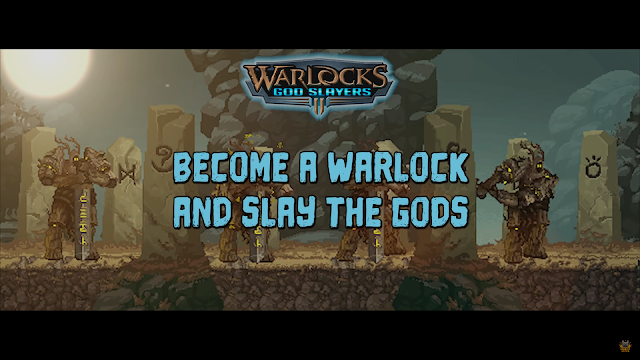 For more information on Warlocks 2: God Slayers, visit the official website, check out the game's Steam page, follow Fat Dog Games on Twitter or follow Frozen District on Facebook.